Cameras to catch speeders and scofflaws are spreading. If you Get the Feeling You're Being Watched you probably are. The village of Schaumburg, Ill., installed a camera at Woodfield Mall last November to film cars that were running red lights, then used the footage to issue citations. Results were astonishing. The town issued $1 million in fines in just three months. But drivers caught by the unforgiving enforcement -- which mainly snared those who didn't come to a full stop before turning right on red -- exploded in anger. Many vowed to stop shopping at the mall unless the camera was turned off. The village stopped monitoring right turns at the intersection in January. Once a rarity, traffic cameras are filming away across the country. And they're not just focusing their sights on red-light runners. The latest technology includes cameras that keep tabs on highways to catch speeders in the act and infrared license-plate readers that nab ticket and tax scofflaws. Drivers -- many accusing law enforcement of using spy tactics to trap unsuspecting citizens -- are fighting back with everything from pick axes to camera-blocking Santa Clauses. They're moving beyond radar detectors and CB radios to wage their own tech war against detection, using sprays that promise to blur license numbers and Web sites that plot the cameras' locations and offer tips to beat them. Cities and states say the devices can improve safety. They also have the added bonus of bringing in revenue in tight times. But critics point to research showing cameras can actually lead to more rear-end accidents because drivers often slam their brakes when they see signs warning them of cameras in the area. Others are angry that the cameras are operated by for-profit companies that typically make around $5,000 per camera each month. 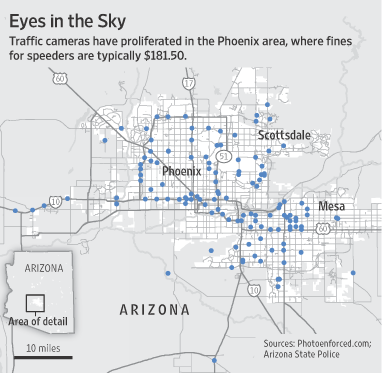 State police started placing the cameras on highways around Phoenix in November. In December, a trooper arrested a man in Glendale while he was attacking a camera with a pick ax. In another incident, a troupe of men dressed as Santa Claus toured around the city of Tempe in December and placed gaily wrapped boxes over several traffic cameras, blocking their views. Their exploits have been viewed more than 222,000 times on YouTube. Republican state representative Sam Crump has introduced a bill in the legislature to remove the cameras, which he says were approved "in the dead of night...as a budget gimmick." Some entrepreneurs are trying to help camera opponents fight back. Phantom Plate Inc., a Harrisburg, Pa., company, sells Photoblocker spray at $29.99 a can and Photoshield, a plastic skin for a license plate. Both promise to reflect a traffic-camera flash, making the license plate unreadable. California passed a law banning use of the spray and the plate covers, which became effective at the beginning of this year. A free iPhone application available on Trapster.com lets drivers use their cellphones to mark a traffic cam or speed trap on a Google map. The information on new locales is sent to Trapster's central computer, and then added to the map. Studies are mixed on whether traffic cameras improve safety. Some research indicates they may increase rear-end collisions as drivers slam on their brakes when they see posted camera notices. A 2005 Federal Highway Administration study of six cities' red-light cameras concluded there was a "modest" economic benefit because a reduction in side crashes due to less red-light running offset the higher costs of more rear-end crashes. About a week ago, right after a coworker told my wife that more of these devices being installed in our area, my wife decided not to run a yellow light. The result was a rear-end experience and $3000 damage to her car. I have been without a car all week (she has mine), and will be without one until April 1. There was more damage done to the other car than ours. There is no economic benefit to these devices. Cities are using these devices to rob taxpayers to pay for needless projects. If this was about safety they would be installing these devices only where there is a high incidents of traffic accidents (or better yet figuring out the root cause of the accidents and correcting that problem rather than hoping big brother to fix it). Schaumburg, Illinois collecting $1 million in fines in just three months, mainly snaring those who didn't come to a full stop before turning right on red is simply ridiculous. Traffic laws ought to help the flow of traffic not impede it. If no pedestrians are present there is no need for a full stop. Can we have a little common sense please? When it comes to speeding on highways, a common sense rule would be to go with the speed of traffic plus of minus 5-10MPH. Someone driving 55 when traffic is flowing at 75 is far more likely to cause an accident than the pack at 75. Traffic in Chicago often flows at 75-80 in 55MPH zones. This is an indication that speed limits are set ridiculously low. Consider this Eyes In The Sky image of Phoenix from the article. Anyone who think this is about safety as opposed to revenue collection, is not thinking clearly.